The Meeting of the Permanent Secretariat in Milan is the first meeting on preparation for the regular meeting of the Intergovernmental Commission. The Meeting was attended by Mr. Eduard Biriucov, Secretary General of the PS IGC TRACECA, Permanent Representatives (National Secretaries) of the Permanent Secretariat (PS) IGC TRACECA in the MLA member states, the representative of the European Commission, team-leaders and consultants of the TRACECA projects, the representative of the International Road Union (IRU). The Meeting participants discussed a number of issues included in the Agenda of the forthcoming IGC meeting: financial issues, Reports on realization by the MLA Parties in 2010 of the Action Plan for 2010-2012 for the implementation of the Strategy of the IGC TRACECA for development of the international transport corridor “Europe-the Caucasus-Asia” (TRACECA) for the period up to 2015 and others. Within the framework of the Meeting there were considered drafts of the reform documents - on further institutionalization of TRACECA and possible exercise by the PS IGC TRACECA of the functions of the secretariat of the “Silk Road” Customs Cooperation Initiative (ITC) at the annual Forum of Customs Administrations of the Great Silk Road countries. The Parties discussed the draft TRACECA Regional Action Strategy on Maritime Safety and Security and Environmental Protection for the period up to 2021 and the elaboration of the Plan of Actions on increasing land transport safety and security in the TRACECA corridor, which are planned to be submitted for approval by the Intergovernmental Commission. 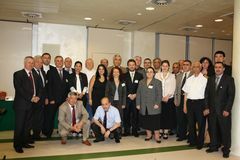 The Technical Assistance Project “Logistical Processes and Motorways of the Sea II” (LOGMOS) informed the project beneficiaries about the aims, objectives and methodology of the project implementation. During the Meeting Mr. Yulian Genkov, the representative of the International Road Union (IRU) made a presentation on the implementation of the preliminary electronic declaration system TIR-EPD. In a number of the EU countries and in Moldova this system is already functioning, technical accommodation of the TIR-EPD system uptake by the national transit systems of Ukraine, Turkey and Kazakhstan is exercised. The negotiations regarding the implementation of this system in Uzbekistan are under way. Preliminary electronic declaration system makes possible to considerably reduce the time of goods passage across the borders, which corresponds to the Strategy for development of the TRACECA corridor and the Concept of Development of International Road Traffic TRACECA adopted by the IGC last year in Brussels. 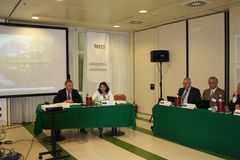 On the outcomes of the Meeting there were adopted the Final Recommendations, there was determined the date of the regular IGC meeting to be held on 24-25 November 2011, in Bucharest, Romania.